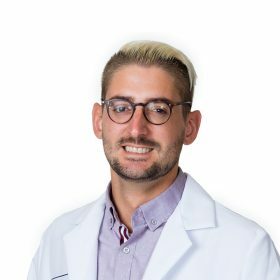 Prior to joining Desert AIDS Project, Dr. Foltz was located in Los Angeles where he completed his training in Internal Medicine and Infectious Disease. He is currently Board certified in Internal Medicine. Originally from the Midwest, Dr. Foltz was born and raised in a suburb of Kansas City, KS. He completed his undergraduate education, majoring in Microbiology, at the University of Kansas, which is located in Lawrence, KS (Go Jayhawks!). He then went on to complete medical school at the University Of Kansas School Of Medicine, located in Kansas City, KS. For Internal Medicine residency, he relocated to sunny southern California, where he completed his 3-year training at Cedar-Sinai Medical Center, located in the heart of Los Angeles. Realizing his interest in Infectious Disease and HIV primary care, he then pursued a 2-year Infectious Disease fellowship at UCLA, completed in the summer of 2017. Dr. Foltz is very passionate about HIV/AIDS and Infectious Disease Medicine. He looks forward to providing comprehensive, quality-driven healthcare here at Desert AIDS Project. Always a fan of Palm Springs and the surrounding areas, he is excited to have relocated to the desert, and to explore the many offerings of the Coachella Valley.